Setting aside outright fabrications (1) such as those promulgated by the Representative Lamar Smith (R-Texas), laughingly selected as the Chair of the House Committee on Science, a common claim in the Comment sections at The Hill and elsewhere is that claims of human interference with climate are evidence of human hubris, and promulgating policies of mitigation arrogance, because humans are just too insignificant to affect the climate, and, no doubt, in every true, religious person’s mind, Christian, Jew, or Muslim (2), the glorious plans of The Creator for human life on Earth. Skeptical Science devotes a major article to this question. My take is a tad different. 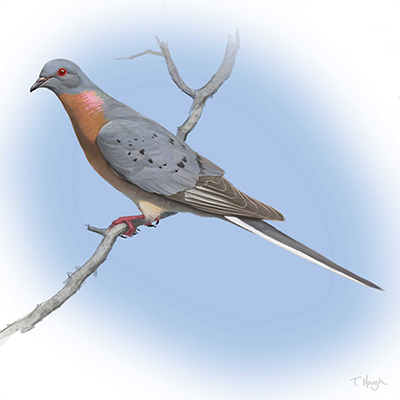 There was once a bird called a Passenger Pigeon. Generally accepted estimates place their numbers concurrent with European contact and colonization of North America at five to six billion individuals. They were easily the most numerous single type of bird in North America. It is entirely plausible, based upon contemporary estimates, they may have been the most numerous single species in the world. Today, they are extinct. Why? These birds were so plentiful, an industry arose to mechanically and systematically slaughter these birds to provide food for the poor and for slaves. Still, the rates of killing must have been amazing. Assuming 6 billion individuals, annihilated over 100 years, well, that requires killing 6800 birds per hour. Sure, it could have taken 200 years, so 3400 birds per hour then. It could have been 5 billion birds and 200 years, so 3000 birds per hour then. Big deal. What probably happened, as happens with many biological populations, was that a great number were killed in a short time, and, then, the natural sustaining mechanisms of the population, such as finding mates and nests, collapsed, since their ecosystems were destroyed, and natural forces did the rest. The end result, extinction, was the same nevertheless. Oh, so right, don’t you feel so much better the last stroke was made by ‘natural forces’ rather than people? Of course you don’t: Anything to get off the hook. Six billion to zero. That’s a pretty powerful human influence. Increasing exposure of people and economic assets has been the major cause of long-term increases in economic losses from weather- and climate-related disasters (high confidence). Long-term trends in economic disaster losses adjusted for wealth and population increases have not been attributed to climate change, but a role for climate change has not been excluded (high agreement, medium evidence). These conclusions are subject to a number of limitations in studies to date. Vulnerability is a key factor in disaster losses, yet it is not well accounted for. Other limitations are: (i) data availability, as most data are available for standard economic sectors in developed countries; and (ii) type of hazards studied, as most studies focus on cyclones, where confidence in observed trends and attribution of changes to human influence is low. The second conclusion is subject to additional limitations: (iii) the processes used to adjust loss data over time, and (iv) record length. [4.5.3]. higher in developed countries”, something which bears upon United States policy. (2) This narrative, that humans are chosen by a Creator or Higher Power from among all creatures for a special role in creation is one of the most damaging characteristics of developed and organized religion. No religious tradition, in my opinion, including Unitarian Universalism, can have a proper environmental sentiment until it condemns and distances itself from that idea. The official UU take on “interdependent web of all existence” in fact down plays its environmental connection, called it “a profound mistake” if it is exclusively applied to the environment. Maybe so, but do expand it beyond the environment minimizes the deep connection we have to the natural world, the deep obligation we have as caretakers, and the deep collective burden and guilt we should bear for initiating the latest planetary extinction event, not only through climate change, but in our treatment of innocent co-partners on the planet, like the Passenger Pigeon. Humanism must extend to beyond humans. This entry was posted in biology, Boston Ethical Society, carbon dioxide, citizenship, civilization, climate, conservation, ecology, environment, history, humanism, rationality, reasonableness, science, Uncategorized, Unitarian Universalism. Bookmark the permalink. Interesting and sad. A religious affiliated group called Arocha works hard on conservation issues and to inform the church about this. Planet wise blog and a man called Dave Bookless. Arocha started in Portugal and then UK and has worldwide links now. Dave is very good on bible and environment and our responsibility. For me I think we use economic motives but can see how religion may have affected attitudes.